Engineering Colleges Direct Admission on the basis of class 12th results in which any students who have scored 45% total marks in 12th can join a private engineering college. 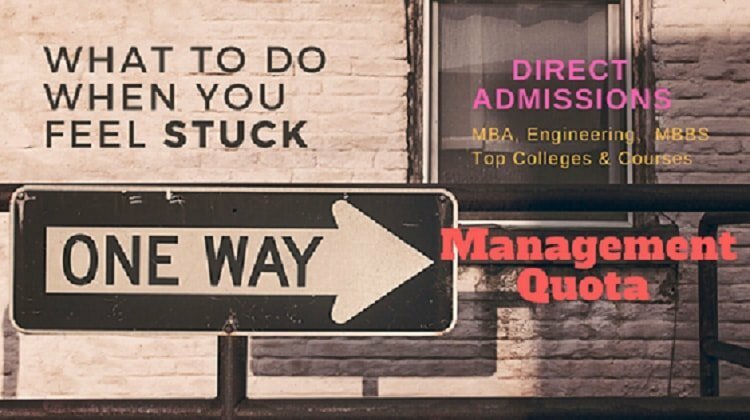 Diploma/B.E/B.TECH/B.ARCH/M.TECH Admission through management seats in top colleges also known as the Institutional quota admission on reserved seats or vacant seats. Most of the private colleges offer direct admission to various courses and colleges. B.E/B.Tech Direct Admission can be done mostly in private engineering colleges. Private institutes have some amount of seats reserved for students who are looking for admission in B.E/B/TECH without entrance exams. But the number of seats are limited. To get B.E/B.TECH Management quota seat donation or development fees have to be paid to the college for admission. The donation or the development fees vary for all colleges, most of the engineering the colleges give direct admission without charging any donation or development fees. Colleges which are among the top 10 private engineering institutes will be collecting a heavy amount of donation or development fees for the sake of direct admission in engineering. Few colleges for some of the engineering branches will charging some amount of donation like computer science engineering (CSE), information science engineering (ISE) and electronics and communication engineering (ECE). Other branches will be free and no donation will be charged only college fees to be paid yearly. Admission In top engineering colleges without Donation, pay only colleges fees per year for admission in some of the good engineering colleges. For direct admission B.E/B.Tech seat without paying any donation or development fees the percentage total scored in 12th will be the admission criteria for admission. Some of the colleges will give engineering admission without donation if the marks scored in 12th is somewhere between 70% to 90% overall. 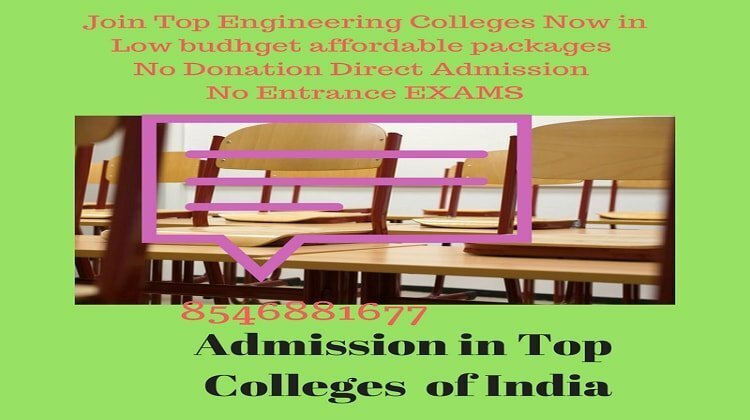 To get admission top engineering colleges donation or development fees has to be paid since the seats are limited in the topmost colleges sometimes the management fees are very high exclusively for topmost branches of engineering in any top ranked engineering college. Few students among many are able to join such colleges who have good financial support and are ready to pay donation amount at the time of admission, the full amount has to be cleared without any installments. List of few Top engineering colleges for Direct Admission. Here is a list of top 10 private engineering colleges in India. Admission without any entrance exams. Students can skip themselves from the heavy burden of engineering entrance exams preparation. Better to go for spot admission if not got a good score on entrance exams. No effect on campus selection even if you join a college directly. Study in some of the top engineering colleges by direct admission procedure. Direct seats give students a second chance to improve their skills and talent. It is also helpful in placements in top companies by joining a reputed college. No matter how weak we are but some of the top colleges will give 100% assured results and overall improvement in learning and becoming successful in future. It is advisable to go for direct admission to join some of the top engineering colleges. Such admissions help students to achieve their goals easily. The total expense will vary from college to college and it is subject to change depending on the performance of a college. Direct seats are free in some of the colleges any only fees per year has to be paid and also fees discount will be given if the student has good marks in 12th exams. The total expense for B.E/B.Tech engineering for the full course including hostel and admission fees is somewhere between 5 lakhs to 10 lakhs full package. Whereas in some of the top engineering institutes the total expanse may go up to 15lakhs to 20 lakhs or more for the full B.E/B.TECH course package. Depending on your budget it is advisable to join any of the engineering colleges. If you are pretty much sure about getting good job or campus selection then take the risk of joining some top colleges by going for education loan for college fees and hostel fees and personal loan for college donation fees if it is required. Education loan will be on 0 % EMI for 4 yrs but after completing engineering start refunding the bank loan to skip from the burden of loan and interest will be charged after 4 yrs if there is some delay in clearing bank loans. B.E/B.Tech/M.TECH/Diploma Engineering Admission In Top Cities. Engineering colleges in Bangalore, Karnataka. Engineering colleges in Delhi, Noida and NCR region. Engineering colleges in Kolkata, Westbengal. Engineering colleges in Pune, Mumbai, Maharashtra. Engineering colleges in Bhubaneshwar, Indore, Bhopal. Most of the colleges among these places have many engineering colleges which offer admission to engineering colleges without donation and only in college fees. B.E/B.TECH Online Admission In Engineering Colleges. Nowadays, Most of the engineering colleges have started admission through online admission system with the help of college website. Just go to the college website and in the admission section, there are online fees payment and seat booking procedure for students who are in far away location and has planned to join the respective colleges. Payment for advance seat booking can be done easily by transfer some part of the college tuition fees and hostel fees to confirm a seat in engineering college. This online seat booking is very helpful for students who have clear knowledge about the colleges and other details and can easily book a seat in the college by online fees payment too. To get B.E/B.Tech seats in top engineering colleges donation or development fees have to be paid by reaching the respective college in person along with all your academics marks card and other important documents. The payment for donation has to be made at one time only or else maximum one month will be allowed to clear the reaming donation fees before the starting of the classes. All donation fess has to be cleared to join the colleges. All payment has to be made either in cash or by demand draft or else the way college ask to pay the donation fees. After paying the donation colleges will give a confirmation letter in the name of the student along with the preferred branch, tuition fees, and hostel fees will be mentioned in the allotment letter. If hostel not required then skip the hostel accommodation fees and hostel fees will not be added to your allotment letter. Once you get the allotment letter if required education loan for per year fees can be received from the banks with zero percent interest rate for four years only. All students who join colleges which are approved by AICTE and UGC can go for education loan if needed. Some of the colleges are giving admission in engineering courses on the basis of class 12th marks if the marks are very good in 12th and somewhere around 80% to 90%. You may get some scholarship from the college up to 50% fees waiver in total tuition fees which is another added advantage of admission in B.E.B.Tech Admission on the basis of 12th marks. This is done to reward the students for scoring good marks in higher secondary school. 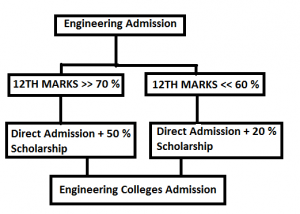 Engineering Colleges Direct Admission not only gives a chance for students to join any colleges but there are many additional benefits also included like fees waiver, scholarship and a chance to select colleges on your own based on your 12th marks. Moreover, the student can skip the heavy burden of entrance exams preparation. It is always advisable to go engineering direct admission if the score in entrance exams is not enough or not written any entrance exams. Also through entrance exams, You may not get the desired branch of engineering or college to join the college with the desired branch. Top colleges in the south India are best and provide quality of education and placements as more companies are located in these locations which will be beneficial for placements. Sign Up for the newsletter to download the Fees Structure for Engineering Colleges. I NEED TOTAL FEE STRUCTURE OF VIT,R V CILLEGE OF ENGENEERING AND SRM. Need an engineering seat at RV College of engineering. Ok, You can Whats App me on 8546881677 to book a seat at RVCE, Bangalore. I need a seat at SRM University for b.tech. Need fees structure of top colleges. I need a seat at SRM University Chennai for B.tech. I need fees structure of BMS college of engineering and Vit. Need a seat in RV college through management quota. Sir, I am looking for BE Computer Science admission in one of top engineering institute in Bangalore via Management quota. I have secured 90% in 12th and 49K rank in ts EAMCET, I want admission in top 10 engineering colleges in Hyderabad. Want to take admission in Bangalore Institute of technology? Direct Admission or through Counseling? Need admission in a top college in Bangaluru in EEE or Computer science? Need a seat in Vit Vellore? Apply for VIT Vellore Engineering Entrance Exam (VITEEE) for VIT B.Tech Management quota seat. Do you give direct admission in BITS GOA?